The Chinese New Year’s cake is symbolic of growing taller, achieving more every year, and of a prosperous year awaiting ahead. It’s often served warm as it is. 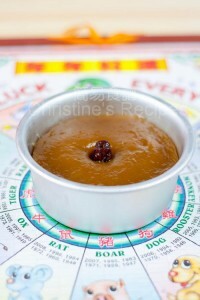 In Hong Kong, people like to have the steamed sticky rice cake, sliced and then pan-fried with egg. If it’s pan-fried without egg, the texture would be slightly crispy outside and still pasty inside. When well-wishers come (拜年 – Bàinián), they’d be served the sticky cake warm, with some other snacks, like turnip cake and taro cake. Grease a 13cm round cake mold (removable base preferred). Sift glutinous rice flour and wheat flour twice beforehand. Add flour bit by bit into syrup, stir constantly along the way, and combine well. If you’d like your batter really smooth, drain through a fine sieve once more. Transfer batter to the greased cake mold. Place in a wok and steam over high heat, covered, for about 60-75 minutes. The time of steaming cake depends on how big and thick your cake is. As the cake is very sticky, even if it’s cooked through, it sticks to your chopstick when you test it. But if you can’t taste any raw flour, it’s done. Make sure to steam the cake for enough time. Traditional decoration for this cake is to insert a date in the middle, after steaming 15 minutes or so when the surface is slightly set. Serve warm or refrigerate for at least 3 hours. When the cake is cold, it’s much easier to slice into thick pieces. Coat the sliced cake with whisked egg, fry on medium-low heat until both sides are brown. Serve hot. Sticky and thick. Simple and good. Have not tried frying it with egg this time.